Mobile World Congress is the venue for some of the biggest smartphone launches in the world. 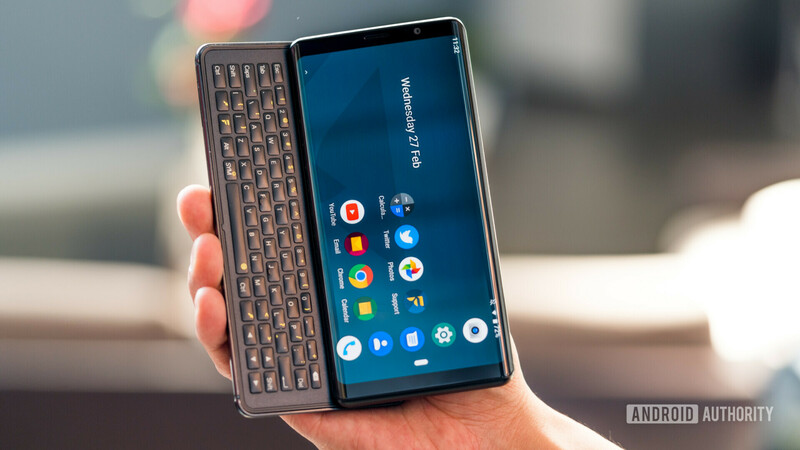 This year, things got a little weird: Samsung and Huawei had phones that fold in half; LG’s flagship sees the blood in your veins; and Nokia brought out a device that might set off your trypophobia. But look past the heavyweights and things get really interesting. Whether it’s a power bank posing as a phone, a phone posing as a walkie-talkie, or a good old blast from the QWERTY past, we saw some weird and wonderful phones at MWC 2019. Here are some of the coolest. What happens when you take an 18,000mAh power bank and a generic Android phone and smash them together (no, not literally)? In the case of the Power Max P18K Pop, great things happen. The P18K is the thickest and heaviest Android phone we’ve ever seen. This bad boy will keep running for days at an end. Hell, we contemplated testing how many of us here at Android Authority could review it on a single battery charge. At least two, maybe three guys? It will be out sometime this fall in Europe for 599 euros. According to Star Trek, in the future we’ll have tricorders that can analyze mystery chemicals and peer inside the human body. According to MWC, devices like that already exist and they’re pretty damn cool. Made by CloudMinds, the Xi is the world’s first smartphone spectrometer. It fires a laser at chemicals and spits out a name within a few seconds. It also runs Instagram and probably Fortnite when you want to chill after a long day of sciencing. Meanwhile, the CloudMinds BGD21 integrates an ultrasound scanner. I mean who doesn’t want to check themselves for bladder stones with their daily-driver? This one’s for all you preppers out there. When society inevitably descends into anarchy – you know it’s happening – you’ll need to keep in touch with your fellow survivors. Those fancy Samsungs and iPhones will be useless, so you’ll want a walkie-talkie, preferably a rugged one. The Nomu T18 is just what you need. It has everything a zombie fighter may want, and more: IP68 water resistance, a built-in VHF/UHF walkie-talkie, anti-explosion hardening, fingerprint recognition, a replaceable 3,200mAh battery, and a hand strap cradle on the back. Bring it on! The HiSense A6 is pretty tame compared to some of the other phones on this list. But how often do you see a phone with two displays, an OLED and an e-ink? The e-ink screen on the back is awesome for reading e-books, but it can do way more than that. You could even mirror the full Android interface on it, if you hate color and spice and everything nice. E-ink screens don’t consume your battery when they’re not refreshed, so battery life should be amazing on this thing. It’s due in April in Europe for 499 euros. This is not really a smartphone, but that’s what Nubia calls it and who are we to judge? The Nubia Alpha features smartwatch specs, with some smartphone features sprinkled in. You can make calls on it, because it supports eSIM. The Alpha has a large OLED screen that bends, a built-in camera, gesture controls, GPS, and fitness tracking. To say it’s not the best-looking device out there would be generous. But we’re impressed with how much tech there’s inside. And it makes for a helluva conversation starter. It will launch in April in China, and later in the second quarter for Europe for 450 euros for the Bluetooth/Wi-Fi version. The eSIM version is due out in the third quarter of 2019 for 550 euros. Remember QWERTY slider phones? A company called FXtec wants to bring them back. Their first product is the Pro 1, and we’re pretty impressed with it. Besides the full hardware keyboard, the Pro 1 has a great-looking OLED display, solid specs, and basically everything you may want in a daily driver. The sliding keyboard makes it a great choice for productive use, whether it’s typing in the next big American novel or just a dank new meme for internet points. It will launch in July for $649. What do you think of the weirdest phones from MWC 2019? Let us know in the comments.